Driving on the Grossglockner High Alpine Road coming from Fusch-Ferleiten or Heiligenblut, you cross four different climes before arriving at the Kaiser-Franz-Josefs-Höhe. This is equivalent to driving from Salzburg to Spitsbergen! The various altitude levels are populated by various large and well-known animals, and also by small residents that aren’t so easy to find. 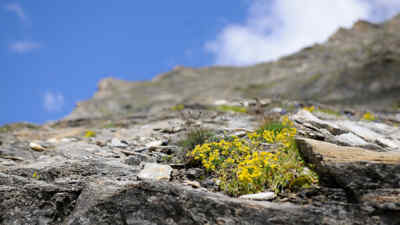 The plant world also changes with every metre you go up in altitude. 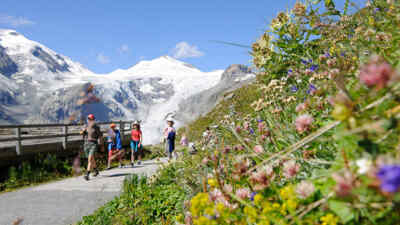 Go on the spectacular drive and multifaceted hikes along the Grossglockner High Alpine Road with the entire family. Even your dog can come with you on this trip! We will introduce you to the most beautiful ways to experience the unique nature of the Glockner mountain world. 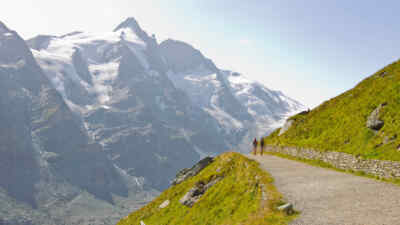 The Grossglockner High Alpine Road offers you the option to comfortably reach several vantage points for short walks with kids and dogs as well as extended hikes. Combine your drive on the popular alpine road with a nature adventure: discover cute marmots, majestic golden eagles and brisk ibexes in their natural surroundings! See countless alpine creatures up close at the tollgate: get to extensive animal enclosures on pram- and wheelchair-accessible paths at Ferleiten wildlife park. This trip is also ideally suited for dogs on a leash. Detailed information about hiking on the Grossglockner! A night in the high mountains is a very special experience. Tranquillity descends over the more than three hundred 3,000 m peaks around the Grossglockner as starlight and moonlight brighten the sky. The night has its very own sounds: the dark call of the eagle owl, the rising and falling of the wind whistling over the mountain faces, the ringing cowbells on the mountain pastures. Discover the Edelweisshütte on the highest point of the Grossglockner High Alpine Road and many other mountain inns, huts and hotels for your overnight stay. Your well-trained four-legged friend is also welcome in many accommodations! It is officially not allowed to camp along the road, becauce it is a nature reserve (Nationalpark). To the accommodation options on the Grossglockner!